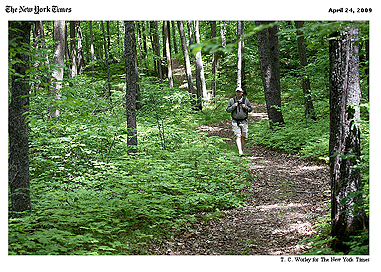 My story in this week’s Escapes section of the New York Times, “Northern Exposure: Hiking the North Country Trail,” covers what may be one day the longest footpath on the planet. 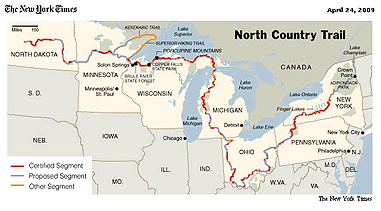 Indeed, the North Country Trail, which is among eight original National Scenic Trails designated by Congress, is on track to span 4,800 miles across the U.S.A. The trail goes through more than 100 state parks and state forests as well as areas managed by the National Park Service. It brings millions of day hikers each year into some of the finest natural places that New York, Pennsylvania, Ohio, Michigan, Wisconsin, Minnesota and North Dakota have to offer. Established in 1980, the North Country Trail is a work in progress, now about halfway completed. From its eastern trailhead at Crown Point and the shore of Lake Champlain in upstate New York, hikers follow more than 1,000 miles of newly cut trails as well as abandoned railroad beds and canal towpaths, detours through state parks and national forests, and miles of dirt roads called connector routes. In total, about 2,600 miles of official hiking trail figure into the current North Country Trail route, with about 2,000 miles to go. “I hope to see it completed in my lifetime,” said Bruce Matthews, executive director of the North Country Trail Association in Lowell, Mich.